Moderate due to navigation, otherwise fairly easy with some elevation. In November of 1923, two young explorers set out from Providence to find the swamp that for years was reputed to be cursed. The stories date back to when the colonists were settling the area. It is believed that they were warned by the Natives of this area and its curse to keep the colonists from this land. It is also said that several of the colonists who did not heed the warning were never seen again. These two young explorers never did reach their destination that day. They were Clifford Eddy and H.P. Lovecraft, (at the time unknown) horror story authors. In September of 2017, a group of hikers led by members of the Northwest Rhode Island Supporters of Open Space set out to Dark Swamp ignoring the heeded warnings. They were successful! Dark Swamp was found and they all made it out to tell the story. It is suggested however, that if you do head out for this hike, be sure to use a GPS device as most of the trails are not marked and there are plenty of side trails and spurs. Starting at a cul-de-sac at the end of Willie Woodhead Road we made our way along the trail in a southerly direction as it climbed slightly uphill. Ahead this trail meets the North South Trail. Bear to the right and follow the blue blazed trail. There are trails to both the right and left that are mostly grass covered. Ignore them and continue straight. At the half mile mark there is a trail on the right with a cellar hole. You will return on this trail. Continue straight passing over a large outcrop of a rock believe to be a threshing rock. Shortly after this rock on the left there is another narrow and grassy trail. Take it, the trail splits, stay to the left and follow the narrow trail. 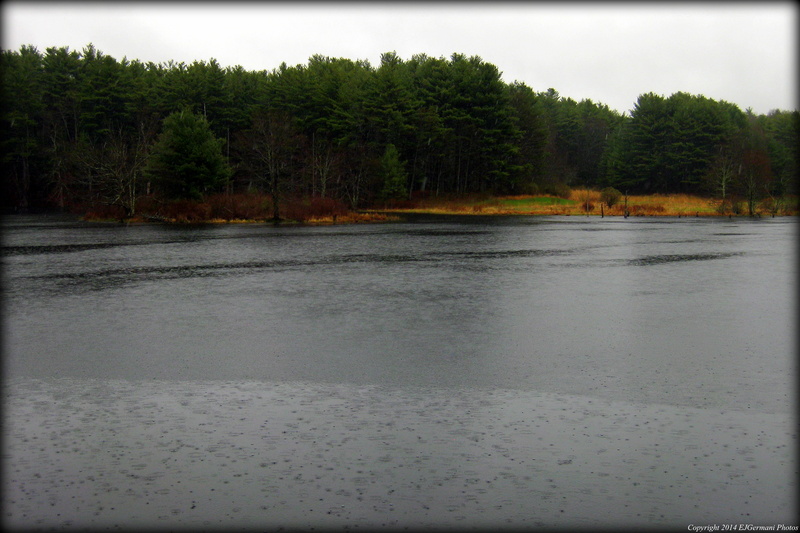 It leads to old ice pond. From here retrace your steps back to the blue blazed North South Trail and continue south. Starting looking for a trail on the right (about 9/10 of a mile into the hike). Take the right, then almost immediately left. Continue straight, passing yet another spur trail on the right, the trail vanishes into a field of ferns. Ahead and below is the first glimpse of the Dark Swamp with its near black water covered with a twisted and interlaced brush over it. This area offers many other sights of swamps. Turn around passing the spur trail (now on your left) and instead of turning right onto the trail you came in on, turn left. This trail, unmarked, winds to the west and then north passing some stone walls before ending. Take note of your surroundings here. At the intersection you will exit to the right when you return. For now turn left. This trail will lead you into the depths of Dark Swamp. Shortly you will see another swamp on the right. Just beyond this swamp you will start to see piles of rocks. These are cairns, similar to the ones in Parker Woodland. Locals believe they may be from the Native Americans. Continuing ahead you will come to another trail intersection. Stay to left here and soon you will catch a glimpse of the swamp once again on the left. At the time of this hike we saw frogs and a heron here. 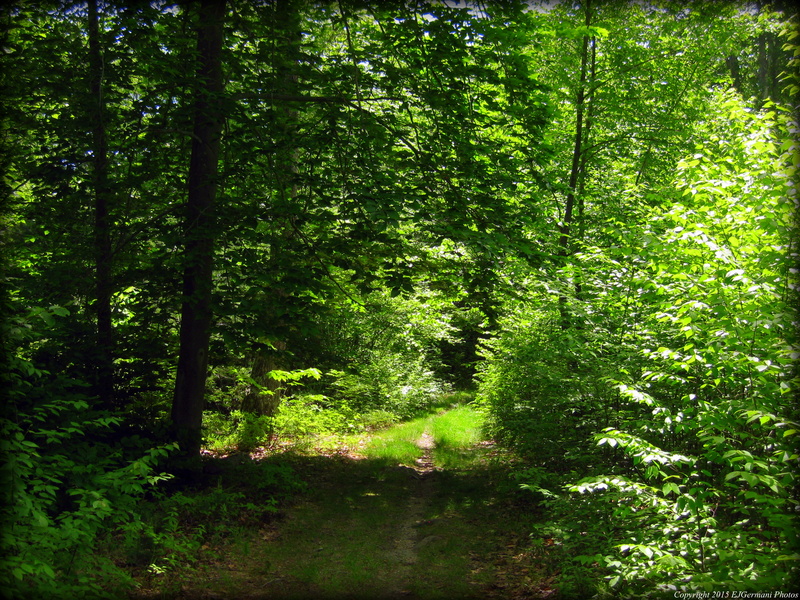 The trail then climbs up and over a rather impressive hill before winding through a hemlock grove. The trail all but ends as you approach the large body of water created by beavers. Here is one of the largest swamps in the area complete with beaver dam and beaver hut. This is great spot for a break and to take in nature. From here retrace your steps pass the swamps and cairns. Continue straight at the “noted” intersection. It soon passes an old building and cellar hole on the left. At the end of this trail turn left. You are now back on the blue blazed North South Trail. The trail back to the car will be on your left. Hunting is allowed here, blaze orange is required during hunting season. And again, use GPS here. I stumbled across this area using a hike described in an old Ken Weber book. Unfortunately, times have changed and part of that described route was impassable. On my first attempt a few weeks ago I had come to find out that a section of the hike is now on private property. Today I went back looking for an alternative route that remains on the Durfee Hill Management Area property. Success! The route that I followed is rather less traveled, not blazed, and narrow in areas but it is clearly defined. There is also a slightly challenging stream crossing. It is still easy enough for children though as our group today included three of them (being led mostly by the five year old before he ran out of steam). I would suggest using a GPS device when embarking on this hike in case you miss a turn and need to backtrack. We started from Durfee Hill Road where the North South Trail enters the management area. We followed the North South for a bit before coming to the first split. Here we turned right onto an un-blazed grass and dirt road known as the Wilderness Trail. At the next intersection we continued straight along the road. We soon came to another split. To the right the road continues a bit passing an old cellar hole before coming to private property. You however want to bear to the left here following the rocky trail that climbs uphill. At the next split we stayed to the right. The path narrows quite substantially as it winds up and down some hills. We then soon came to a stream that is wide enough to be a challenge. We took a moment to survey the situation and came up with a plan to literally pass the kids over the stream to each other. We all somehow managed to stay dry. Continuing on, we soon came to another trail that looks like a cart path of some sort. We stayed to the left here and it exited onto Willie Woodhead Road. Turning left and following the road we were soon passing a gun club on the right. The road soon ends and becomes a rocky trail again and begins to climb slightly uphill. At the next intersection we turned left onto the Gray Squirrel Trail which is part of the North South Trail. The remainder of this hike follows the blue blazed North South mostly downhill back to the cars. Along this stretch we saw several birds including a scarlet tanager, a stunningly beautiful bird. Trail map can be found at: Durfee Hill East. Moderate due to hills and unmarked trails. This morning I ventured into the Durfee Hill Management Area with a fellow hiker. It was a very wet and rainy hike, but nonetheless, a nice little stroll. We followed the route (for the most part) described in Ken Webers book “Weekend Walks in Rhode Island”. Starting at a parking area by the checking station on Reynolds Road (Rhode Island Route 94), we made our way to the road and turned left following it downhill while looking for a trail on the right after pole number 33. Turning right onto the trail we were immediately in an area of pines with a large ledge to our right. At the next intersection we explored the path to the right to see if we would find an overlook. After a little bit we gave up on that and returned to the previous trail. Continuing on the trail we passed a marsh area on the right before it opened up to a clearing. At the clearing we followed the trail to the left to a Y intersection. We went left here and soon we could see a small pond to our right. The trail went downhill into an area of mud with a small stream crossing. Just after this point we turned left looking for and eventually finding a faint trail that climbed a rather substantial hill to its top. Stop, take a breather! At the top of the hill we followed the ridge line to the left until it met with another trail. Taking a quick left then right the trail eventually came out to Route 94. In this stretch we saw three deer. We then crossed Route 94 to the orange gate on the other side. We followed that trail passing a historical cemetery on the left. The graves here were dated from the early 1800’s. Just after the cemetery the trail splits. We followed the trail to the left and downhill. At the bottom of the hill we followed a narrow trail to the right and up a hill. The trail then turns left an downhill to an intersection. We turned left at the intersection and followed the open lane passing a small pond and brook on he right. Ahead we came to a large pond. We turned right and followed the trail away from the pond back into the woods and uphill. This trail runs through a large area of pines and hemlocks. We then came to a Y intersection. We followed the trail to the left and went downhill towards the pond. After crossing a brook we came to an opening. (The description we were using calls for a tractor road at this point. It was not very obvious to us. So we did some exploring.) After following the edge of the woods for a bit we did come to the road. It slowly climbs uphill back to the checking station where the cars were parked. Trail map for this site can be found at: Durfee Hill. However most of the trails described are not shown.